Hey everyone, I'm here today sharing my newest layout featuring the bright and colourful December Kits. 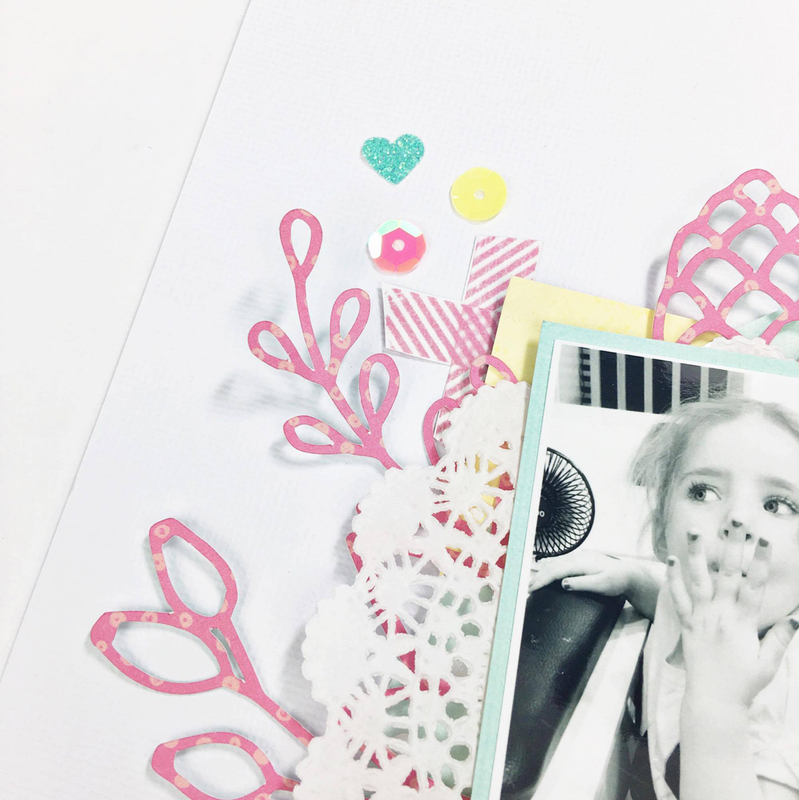 For my layout today I have focused on creating a multi-photo layout which features the gorgeous exclusive floral cut file design by Bea Valint for HKC. The photo I am documenting is a series of photos taken when I took my little girl with me to our local nail salon. The ladies there were so lovely and offered to paint her nails too and she was so excited. She loves when I paint her nails at home, but getting them done out made it just that little more special. A Mummy-Daughter pamper outing together, how fun. I documented the story using my fave way - strip journaling typed on my typewriter. For the layout title I added the Amy Tangerine foam thickers sentiment moments, onto a scrap of yellow patterned paper from the Pink Paislee Take me Away collection. It adds that perfect pop of colour to the page and helps the white thickers stand out. The 'special' was added with the super cute silver glitter foam thickers. I created a little cluster to the right of the photos that features some of the amazing Pink Paislee Take me Away ephemera, some of the Birthday Bash sequins and even the asterix from the Amy Tan thickers. To add some detail to this cluster I added some foam adhesive under certain pieces. I added a small scattering of embellishments to the top left of the layout too, to help balance it. The little heart is punched from the American Crafts glitter tape using a tiny American Crafts heart punch. Whats great about the glitter tape is that it is adhesive backed, so once I punch the shape out I simply peel off the backing sheet and stick it to my page. In this multi photo layout there was one photo which I wanted to stand out more than the rest. To help achieve this I printed it slightly larger than the other two and also backed it on the yellow - a brighter colour, to help it pop off the page more. I also adhered the photos on a foam adhesive which gives the photos that extra bit of dimension. 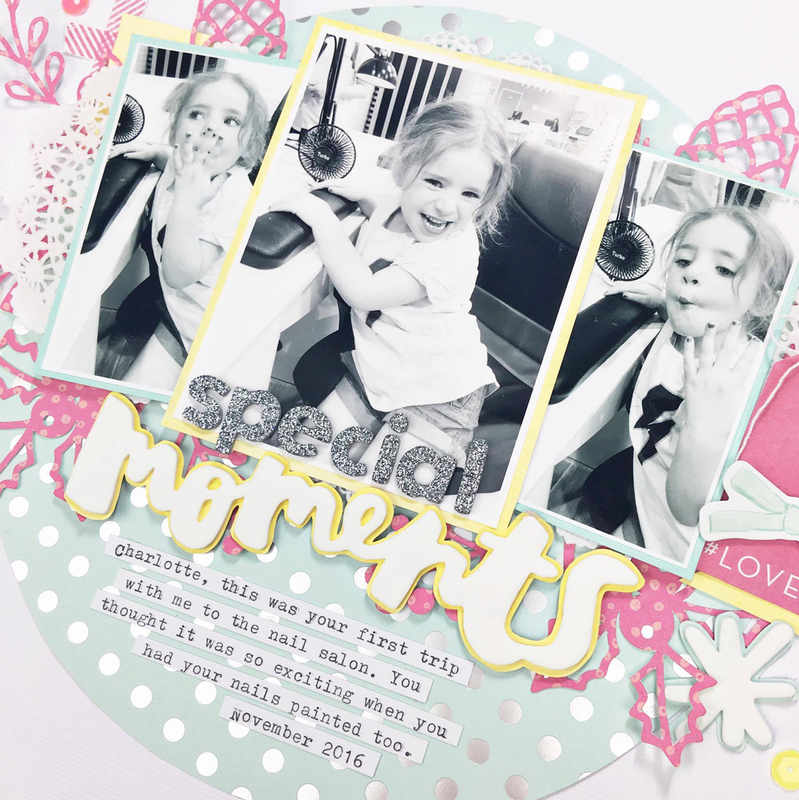 I hope this post has inspired you today and given you an idea for a multi photo layout using cut files.